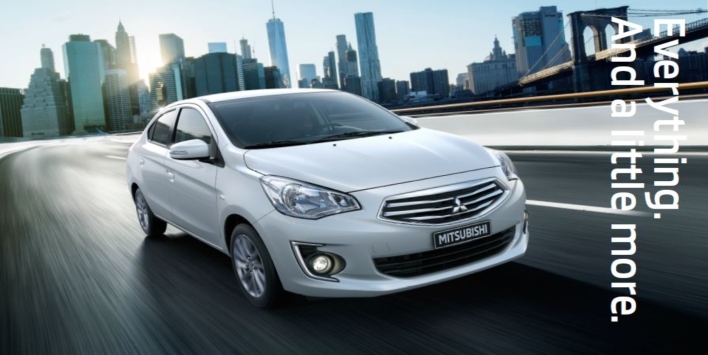 The 2019 Mitsubishi Attrage is your perfect choice for modern economic cars this year, owing to its fuel efficiency, attractive design and easy maneuverability; making it the undisputed compact sedan in the market. The Attrage is available only at Zayani Motors, the exclusive dealer of Mitsubishi in the Kingdom of Bahrain, with a special offer of a ten-year or one million kilometre warranty to ensure the best value for your purchase. With a fuel consumption rate of 22 km/litre, the Mitsubishi Attrage allows you to travel more for less spending on fuel; enabling you to drive for 770 kilometres before you refill the tank. The 1.2-litre, 12-valve and three-cylinder engine of the Attrage produces maximum output of 57kw/6000rpm and maximum torque of 100nm/4000rpm, adequately giving you the desired acceleration while remarkably maintaining fuel economy. One of the many features that placed the Attrage above all in its class is the generous space of the cabin and trunk, reiterating on the intelligence of the design that prioritises the comfort of drivers and passengers. The simple yet stylish interior surrounds you and your passengers with quality materials, smooth flowing lines and a seamless fit and finish that conveys quality craftsmanship. The cabin of the Attrage comes with several storage points and amenities that are smartly located for you convenience, such as floor console cup holders, door pockets with bottle holders, a tray and glove box, convenience hooks mounted behind the front seats, seatback pockets and a rear cup holder. Several other modern amenities contributed to making the Attrage the leading compact sedan that caters to all your needs in a practical and contemporary vehicle. This includes audio and Bluetooth handsfree system that could be effortlessly controlled using the easily-reachable keys on the steering wheel, a USB port, CD player, an easy-to-read large meter cluster, keyless entry, push-start engine switch and much more. The safety of the driver and passengers was given utmost priority in the manufacturing of the Mitsubishi Attrage, which features a solid Reinforced Impact Safety Evolution (RISE) body, driver and passenger SRS airbags, active stability control, hydraulic brake assist system and a four-wheel Anti-lock Braking System (ABS), which comes with Electronic Brake-force Distribution (EBD) for better control during emergency breaking. Book your test drive today by calling or visiting Zayani Motors showrooms in Sitra (+97317703703) or Arad (+97317465533). P.O. Box 26, Manama, Kingdom of Bahrain.